« DIGITAL MARKETING Three ways anyone can start reaching more customers right away! 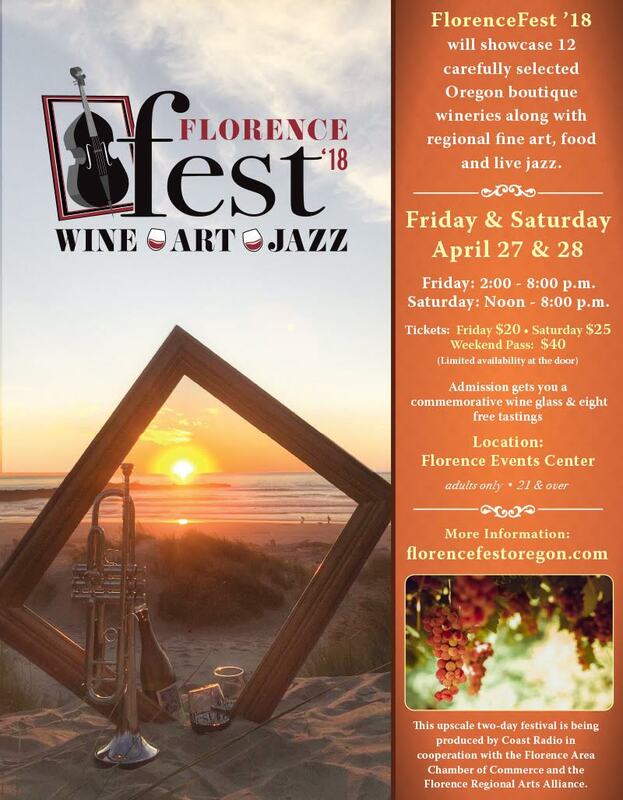 Seven national-caliber jazz acts will complement 12 Oregon wineries and an invitational juried art show and sale, to lure aficionados of discerning tastes to Florence, Oregon, for FlorenceFest ’18. The two-day event takes place at the Florence Events Center from 2:00 to 8:00 p.m. Friday, April 27, and noon to 8:00 p.m. on Saturday, April 28. Pre-event tickets are $20 for Friday, $25 for Saturday, and a two-day pass is $40. Tickets are available exclusively at FlorenceChamber.com/FlorenceFest or at the Florence Area Chamber of Commerce’s visitors’ center, 290 Highway 101. Tickets are limited in number and, if available at the door, will be an additional $5 each. Admission is restricted to adults 21 and over. The stellar music line-up includes headliners the Tony Glausi Quartet on Friday and the George Colligan Quartet on Saturday. Both performers are highly-respected composer/arranger/collaborators on the national scene. Friday’s line-up begins at 2:00 p.m. and includes Bossa PDX and the Paula Byrne Quartet. Saturday’s shows start at noon and feature the Michael Anderson Trio, Bossanaire, and the Gerry Rempel Jazz Syndicate. Wineries from throughout Oregon include Hanson Vineyards, Cathedral Ridge Winery, J Scott Cellars, Sineann, Campbell Lane Winery, Lady Hill Winery, Noble Estate Vineyard and Winery, HV Cellars, Abbey Creek, Emerson Winery, Cardwell Hill Cellars, and Troon Vineyard. The juried art show and sale will include 60-plus finalists out of more than 100 entries from Florence, Eugene, Portland, Ashland, and nine other states as far away as the East Coast. The top-three best-in-show prizes range from $250 to $1000 with additional cash awards of $250 for best in 2-D, 3-D, photography, and a People’s Choice award. The event is coordinated by the Florence Regional Arts Alliance.